Leave your laptop behind as your android phone works adequately well. Unburdening of this kind is quite helpful. Everybody is busy only with a smartphone. This is very businesswise. We are passing through the smartphone stage of internet age towards the internet of everything. People get really busy with smartphones and most of those are run upon android. That is how android is emerging into ultimate marketplace for the most of goods and services, you use. Through this smartphone stage of internet age, the growth rate of android is globalizing humankind at the top of everything else. Therefore any business must consider getting distributed via android apps. 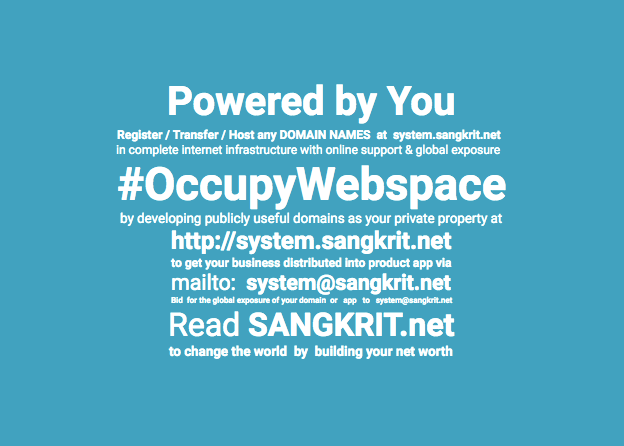 Independent individuals having SANGKRIT.net account work everywhere as personal outlets facilitating all that. Registering or transferring a domain of your choice at is made easy at http://system.sangkrit.net and downloading android app Shardul Pandey from Play Store, connects with the System Administrator direct for business. He helps you make your domain publicly useful and getting that distributed through android apps to make your business. The creator of Windows Bill Gates is still the richest individual on planet Earth and he does not use any iphone but like the creator of Linux Linus Torvalds, he too has preferred using an android phone. That is the case with every sensible person aware of evolving powers around. Google teamed up with nGenx for launching a solution for Chromebook & Chrome OS users to access any desktop app still requiring Windows through the web. nFinity Browser provides you an IE8 user experience, settings, & accessibility; browsing without any limitations. WPSmart Mobile is the brand new responsive mobile theme plugin that automatically gets your WordPress website mobile-ready using a beautiful theme that automatically adjusts layout depending on the device like iPhone, Android, BlackBerry, or Windows Phone etc.